This classic, basic recipe is an easy method that allows the creamy, rich avocado flavor to take center stage. Optional add-ins are suggested, too. It's a great complement to any Mexican meal, and also makes a great sandwich spread. SIMPLE GUACAMOLE: Cut avocados in half lengthwise, twist halves apart. Remove pit by hitting it with sharp base of knife blade and twisting. 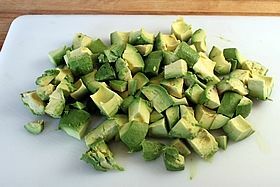 Scoop out flesh of avocado onto plate or cutting board. Sprinkle on garlic powder, salt, and pepper. 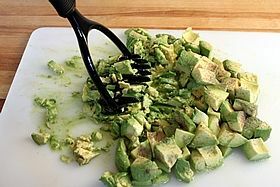 Use potato masher, pastry blender, or fork to mash avocado to desired consistency. LOADED GUACAMOLE: Follow above instructions. Then stir in any or all of the optional additions. Taste and add salt, if needed. 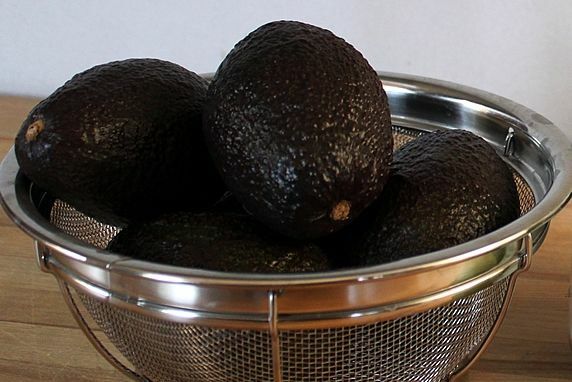 To refrigerate and serve later: press out any air pockets with back of a spoon, cover with double layer of plastic wrap that is pressed against the guacamole to remove layer of air. Refrigerate up to 4 hours. In my family, our philosophy about guacamole is this: the best guacamole is the simplest. I grew up in New Mexico where Mexican food was as much a staple in our home as milk and bread. To me, guacamole is a required accompaniment to any Mexican meal. My big sis, Nelda, taught me how to make guacamole many years ago. The rich, creamy flavor of the avocados takes center stage. And, it's so, so easy to make it this way. So, I'm sharing our simple family guacamole recipe today. I did have to figure out measurements in order to share this with you, because this is one of those recipes that we've always made by smashing an avocado on a plate and sprinkling on a little salt, pepper, and garlic powder--done. Now, for the first time, just so I can share this with Yummy readers, we have a written recipe for this time-tested family favorite. Simple & Loaded versions. The printable recipe includes my simple, basic guacamole along with popular add-ins to make a loaded version for those who prefer it. First, some basics about avocados and guacamole. Avocados are crazy good for you. Read about their health benefits here. There are lots of varieties, but I think Haas are the best by far. Unripened avocados will ripen in about a week at room temperature. You can speed the ripening by a couple of days by placing them in a paper bag with a small piece of apple or banana. Once ripened, put them in the fridge where they will hold for up to 5 days. If I want to serve guacamole at a party and time it so that the avocados are ripe on party day, I buy unripened avocados a week ahead, ripen them in a paper bag, and transfer them to the fridge until it's time to make the guacamole on the day of the party. Returning the avocado pits to a bowl of guacamole does nothing to prevent browning. I've done that for years, and have recently learned that it's been tested and simply doesn't work. Never again. Adding citrus juice to guacamole doesn't prevent browning. Say what? I've always thought that lime juice was added to guac for that very reason. Turns out that it doesn't work, unless you add a huge amount that ruins the taste of the guacamole. 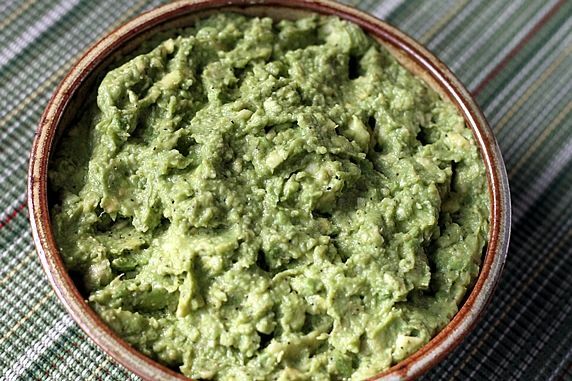 The only reason to add a small amount of lime juice that is called for in many guacamole recipes is because you like the taste. Otherwise, leave it out. I have never added lime juice (prefer the taste without it), unless I was making a big batch ahead of time for a party. I only added it to prevent browning. Now I know it doesn't work--never again. I've read about these myth-busters in numerous places lately; it's been tested and well-explained by the food lab at SeriousEats. These were shocking revelations to me, a life-long guacamole maker. What does work to keep guacamole from browning? Preventing its exposure to air. 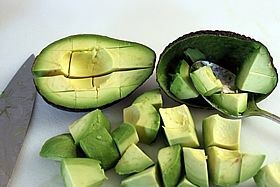 Oxygen is the culprit that turns avocados brown. How to accomplish that? 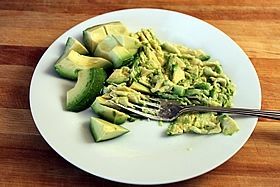 Place guacamole in a bowl, flatten it with the back of a spoon to remove any air pockets, cover it with 2 layers of plastic wrap that are pressed firmly against the guacamole to remove any layer of air between the guac and the wrap. Put it in the fridge. This should prevent browning for 2-4 hours. Air permeates plastic wrap eventually, so the guac will start browning at some point. But it will hold this way for a short period. Similarly, put the guacamole in a heavy, freezer-quality Ziploc bag. Press out as much air as possible before zipping it closed. This also prevents browning for 2-4 hours. 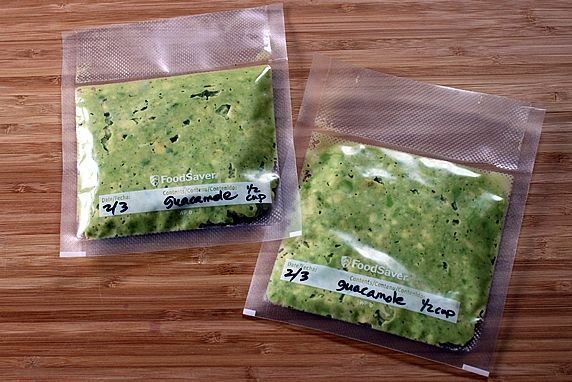 Vacuum seal the guacamole using a Foodsaver-type sealer. I've vacuum sealed both in the heavy plastic bags and in jars using the Foodsaver lid attachment for sealing. I was able to hold the guacamole overnight in the fridge this way. click here for Amazon link to Foodsaver I use and recommend. I had a bunch of guacamole leftover from the Mexican Buffet Dinner Party we had last fall, so I tried freezing it for the first time. I was amazed at how well it held up in the freezer. Use either the Ziploc plastic bags or Foodsaver bags as explained above. Flatten the guacamole in the bag so that it is in a thin layer (not a thick blob). Freeze it for up to 2 months. To thaw it, transfer the frozen bag to the fridge to thaw gradually, or put the frozen bag in a bowl of water to thaw it quickly. NOTE: For best consistency, I don't recommend freezing guacamole that has additional ingredients like tomatoes. Only freeze plain, avocado-only guacamole. Step 1. Assemble the ingredients: avocados, kosher salt, freshly ground black pepper, & garlic powder. Step 2. Cut avocados in half lengthwise and twist to separate the halves. Whack the pit with the wider base of a knife blade and twist to remove the pit. Step 3. Score the flesh of the avocado with the sharp end of a knife in a grid-like pattern to create cube shapes. Scoop out the pieces with a spoon. Step 4. 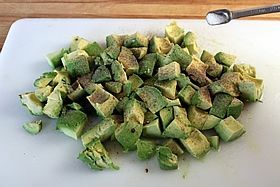 Sprinkle the cut avocados with salt, pepper, and garlic powder. Garlic powder, not fresh garlic. 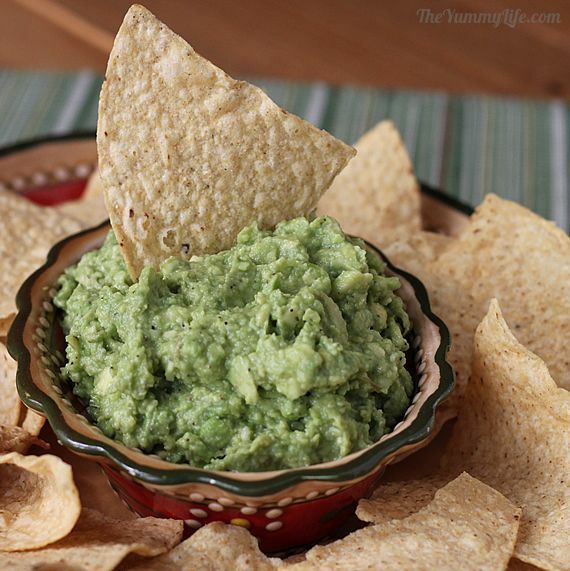 Although I prefer fresh garlic in most recipes, garlic powder works better in guacamole. Fresh garlic has too much bite to it and can overpower the mild avocado favor; garlic powder is milder and blends in better. Step 5. Use a potato masher or pastry blender to mash the avocado to the desired consistency. I like mine a little bit chunky. If I'm making a small portion with a single avocado, I just use a fork to mash the avocado on a small plate. Loaded Guacamole. If you prefer your guacamole with some additional ingredients, any or all of these can be stirred in: chopped cilantro,tomatoes, onions, or peppers. (Suggested quantities are in the printable recipe below.) Some people also like to stir in salsa, hot sauce, or sour cream. But for me, I like guacamole where the lightly seasoned avocados are the main only event. 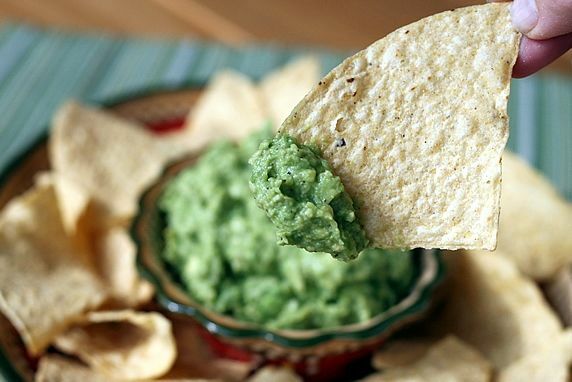 Chips and guacamole are a match made in heaven. It makes a great sandwich spread, too. Ever tried a BLTG (Bacon, lettuce, tomato & guacamole) sandwich? Awesome. The challenge is to refrain from eating the whole bowl. 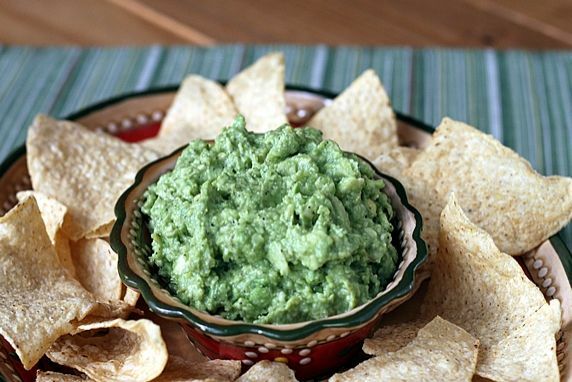 How do you like your guacamole--simple or loaded? Make it a yummy day. ¡Ole!